This is a very basic risotto with classic flavors. The vegan twist involves adding a soft cashew cheese to add a rich creaminess to the dish. Note: I consciously made this risotto thicker than I normally would because I made it with the intent of its being a precursor to another dish, Supplí. 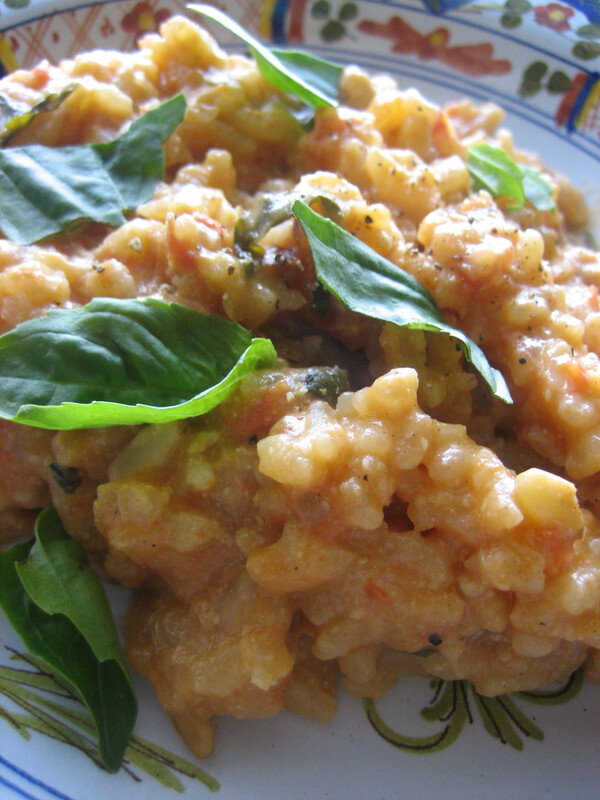 You can adjust the consistency of your own risotto by the amount of broth you add near the end of the cooking time. Make the cashew cheese in a food processor by adding the tofu, cashew and nutritional yeast. Pulse to break up and add in lemon juice. Drizzle in olive oil until there is a thick and creamy consistency. Season with salt and pepper. Set aside. In a soup pot add the vegetable stock and pureéd tomatoes. Heat to a simmer then turn down to low. Sauté the onion and garlic in a drizzle of olive oil until the onions have softened. Add in the rice and mix well to coat the grains entirely with oil. Continue cooking for a few minutes. Add in the white wine and cook until fully absorbed into the rice. Add in a ladel-ful or two of the broth/tomato mix and mix into the rice. Continue to add in broth once the previous broth mixture has been absorbed. Keep doing this until the rice is soft to the tooth yet still has a slight bite in the center of the grain. Stir in some freshly chopped basil. Ladel the risotto into bowls and add 1 tablespoon of the cashew cheese per bowl. You can either mix this in or allow your guests to do it at the table, which can be fun. Garnish with fresh basil and toasted pine nuts, if you wish.